The background music you hear in the elevator, at the grocery store – or in your favorite new commercial is often forgotten the second you move on with your day. Occasionally though, that music is part of an album that holds up extremely well up against the popular music of the moment. Today’s featured artist has been featured in all of the above media – but most music fans aren’t aware he exists. Matthew Nicholas Hales was born in Southampton, England in 1972. His parents ran an independent record store, so it’s safe to say he was exposed to music at a young age. Because of that exposure, he aspired to be a musician at a very young age, starting to play the family piano at age four. Matthew was somewhat of a prodigy, and continued his learning and playing into high school. At age 16, he was awarded a scholarship to study music composition at Winchester College in England. Within his first year, he wrote his first symphony titled “Life Cycle” and formed his first band. In the spring of 1990, the band (known at that particular time as Mecano Pig) produced their debut album. In spite of the hope, they broke up shortly thereafter and Hales was searching for direction. He moved to London to study music at City University and formed a new band in 1992. Eventually being called the 45s, they signed to a major label and put out two well-received albums – but it didn’t quite work out, and Hales was back on his own in the early 2000’s. Shortly after the 45s breakup, a television commercial for the new Volkswagen Beetle was released, and the track in the background was titled “Strange and Beautiful.” When people were frantically searching who it was by, they found a “band” tilted Aqualung that seemed to have popped up out of nowhere. Aqualung was simply Matthew’s new solo act, and he was incredibly hot. He signed with a smaller label and put out a couple quick albums to satisfy the demand around the UK. After generating buzz across the pond in the US, the same single reached Top 40 airplay success. Aqualung would sign with Columbia Records and release his US debut called Strange And Beautiful. Hitting shelves in 2005, it was more or less a combination of his first two UK albums rolled up into one album for US consumption. The album rocketed to No. 3 on the Billboard charts and sold a quarter million copies by year end. His music would end up being featured in countless television shows and films, including CSI, Scrubs, One Tree Hill as just a couple examples. When I first heard this in early 2005, it was a complete change of pace with what I was listening to at the time. 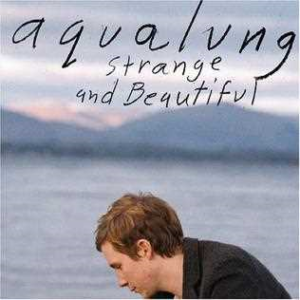 Aqualung’s music is reflective and slower paced, very contemplative type rock. The star of the show unquestionably is Hales vocal, which doesn’t have much comparison for me. CTT devotees may recall a dubstep-ish artist I reviewed years back called James Blake, he is about as close to Aqualung as I can think of offhand. Because of the elements of soul and folk rock mixed with the electronic overtones, this is an album that doesn’t fit into the standard genre grab bag. While critically that blending is well respected, it makes it very hard to get picked up by the major stations and often puts you on the “indie” type radio play. If it wasn’t for all the other media he was featured in (including a series of ads for Chrysler), I’m not sure I, nor most, would have ever caught on to his tunes. Soft electronic is certainly not a music type you often hear about, or a genre you find your friends bugging you to try out. It’s probably not for everyone, but if you have the slightest intrigue, give this a shot today. It’s likely one of the best albums you’ve never heard. Good times gonna come if you pick this up today and your day might just be brighter than sunshine. Happy Tuesday!